For the past few years couples have chosen their favorite drink or a drink in their color scheme to be their 'Signature Drink'. Another way to carry out a theme. My wedding had 3 Signature drinks. 'The Newport' made up of Lemonade and Blueberry vodka (where we got engaged), 'The T' made up of Iced Tea and Raspberry vodka (my new last name) and of course the Mai Thai (we honeymooned in Maui and Kauai). I think couples are getting more adventurous and opting for Specialty Bars, ie: Martini or Margarita Bars. The bartender can mix up tons of options to keep the guests guessing. With all the flavored vodka and tequila the skys the limit. 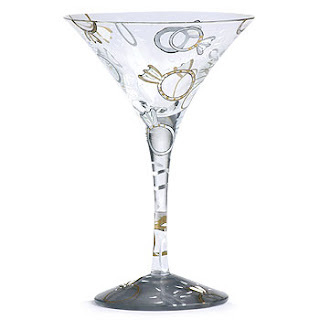 You can even get the wedding martini glass as your 'toasting glasses'. A recent client of mine wanted to have mini shots of Patron tequila passed to the guests instead of the traditional champagne toast. Whatever you decide don't forget to adorn your Signature drink glass with an umbrella, cheers flag or a piece of fruit.